James H. K. Kaiwi has gone, 1915. REV. J. H. K. KAIWI HAS PASSED. Aloha oe.—Please allow me an open space in your slim body, for these words placed above, so that the many friends, companions, and fellow laborer in the work of our loving Lord in the Archipelago may learn of this sad news. On Sunday, the 14th of this past February, at 10 p. m. of that evening, the angel of destruction of all bodily spirits came visiting at their Residence at Keaalama, Opihikao, Puna, and took away the breath of life from his body, and left his remains to his wife, children, grandchildren, friends, and the Church which the two of them were connected with aloha. The sickness which caused his death was a tumor in his breast; which he had for perhaps 8 months. Hilo Boarding School student roster, 1844. 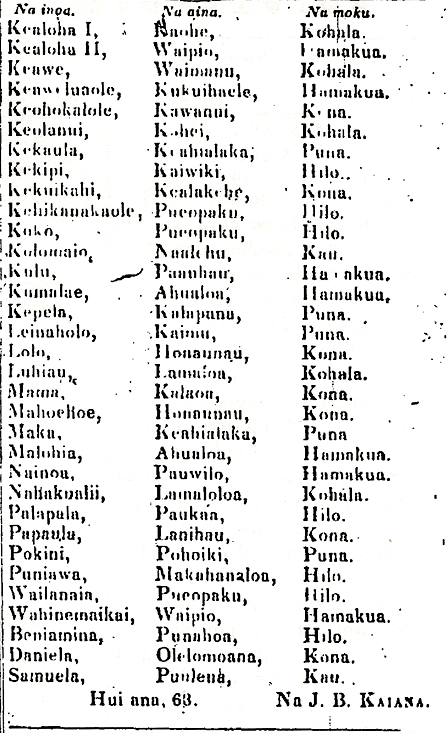 A Roster of the Administrators, Teachers, and Students of the Boarding School at Punahoa, Hilo, Hawaii, January 8, 1844. Rev. A. Thurston Rev. D. B. Lyman. Rev. c. Forbes. Mrs. S. J. Lyman. Rev. J. D. Paris. I. B. Kaiana. Ka Nonanona, Buke 3, Pepa 22, Aoao 113. Maraki 19, 1844. 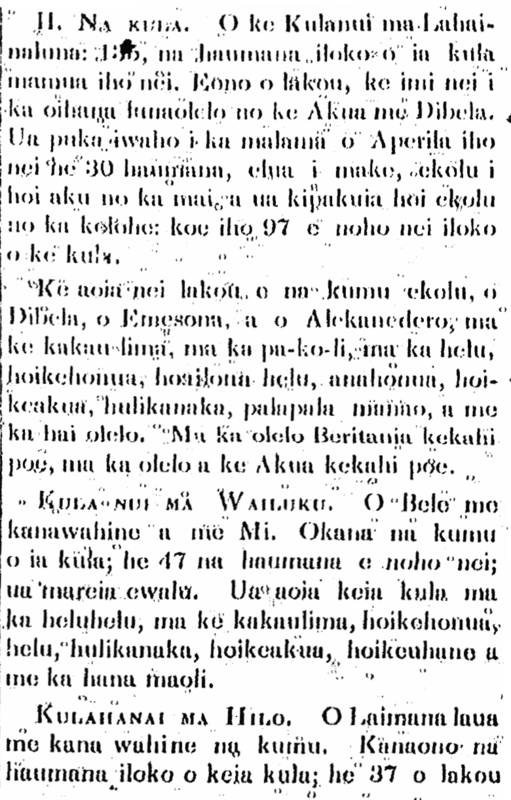 Ka Nonanona, Buke 3, Pepa 22, Aoao 114. Maraki 19, 1844. James A. E. Kinney and his ohana, 1943. The picture above is of James A. E. Kinney, the son of K. W. Kinney of Hana, Maui, and one of the writers to Ka Hoku o Hawaii. It is believed that A. E. Kinney is at Sea with the Air Force, doing air surveillance [kilo ea]. He graduated from the air surveillance school in Grand Rapids, Michigan this past April and returned to his post at West Palm Beach, Florida, and thereafter it was decided to send him to sea. 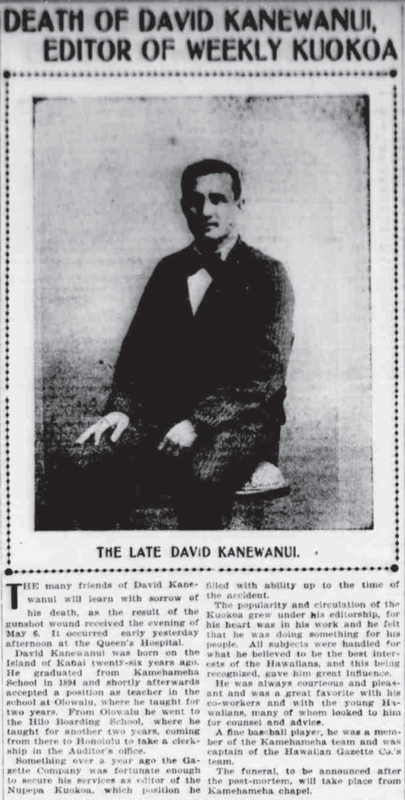 English version of David Kanewanui’s Death Announcement, 1902. THE many friends of David Kanewanui will learn with sorrow of his death, as the result of the gunshot wound received the evening of May 6. It occured early yesterday afternoon at the Queen’s Hospital. David Kanewanui was born on the Island of Kauai twenty-six years ago. He graduated from Kamehameha School in 1894 and shortly afterwards accepted a position as teacher in the school at Olowalu, where he taught for two years. From Olowalu he went to the Hilo Boarding School, where he taught for another two years, coming from there to Honolulu to take a clerkship in the Auditor’s office. Something over a year ago the Gazette Company was fortunate enough to secure his services as editor of the Nupepa Kuokoa, which position he filled with ability up to the time of the accident. The popularity and circulation of the Kuokoa grew under his editorship, for his heart was in his work and he felt that he was doing something for his people. All subjects were handled for what he believed to be the best interests of the Hawaiians, and this being recognized, gave him great influence. He was always courteous and pleasant and was a great favorite with his co-workers and with the young Hawaiians, many of whom looked to him for counsel and advice. A fine baseball player, he was a member of the Kamehameha team and was captain of the Hawaiian Gazette Co.’s team. The funeral, to be announced after the post-mortem, will take place from Kamehameha chapel. The Hawaiian Gazette, Volume XXXVII, Number 39, Page 5. May 23, 1902.